The workshop DARIAH-CH is an important event in the process of adhesion of Switzerland to the European consortium in Digital Humanities DARIAH, organized in the framework of the H2020 project DESIR. The session on "Research practice in Digital Humanities" includes a Poster SLAM session in order to illustrate the current projects in the Swiss Academic Institutions. DARIAH-CH workshop is currently inviting 20 scholars or teams who want to present a poster which will be exhibited during the meeting and will be presented in a slam session on 30th November. The posters represent an opportunity to present new experiences in Digital Humanities (research project, teaching methods, etc. ), works in progress or smaller research contributions in a concise and visible format. 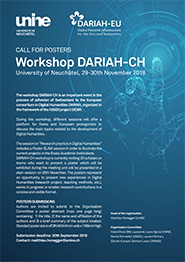 DARIAH-CH workshop is currently inviting 20 scholars or teams who want to present a poster which will be exhibited during the meeting and will be presented in a slam session on 30th November. The posters represent an opportunity to present new experiences in Digital Humanities (research project, teaching methods, etc. ), works in progress or smaller research contributions in a concise and visible format.